Each week I'm going to host a link up so that I can see all of your thrifty finds and I will choose my favorite one to feature each Thursday. That will give you guys exposure and an incentive to link up! Your thrifted item can be anything: thrifted clothing you wore in an outfit post, thrifted home knick-knacks, or anything you want to share! I've also changed the Thrifty Thursdays link up button and added new ones to the Thriftfanatic page. I will accept submissions until Monday at 11:50PM MST! Such a fun idea!! I linked up my vest that I thrifted!! It's so much fun to go to these stores!!! (: Have a great day! This outfit is so cute you look adorable! cute, cute, cute lady! I love your yellow skirt, such a pretty color. I'm excited for the return of thrifty thursdays! What a great idea!! I’ve been ill and haven’t been on my blog much lately, but I’ve linked up one of my posts from a week or so ago (with a dress I “thrifted” on Ebay for 6 bucks! I hope that counts!) and will definitely continue linking up with this series. LOVE your blog, I am your newest follower! You are adorable, as always!! :) I need to go thrifting with YOU sometime! You always find the cutest things! love that skirt- especially on you! the skirt looks so lovely on you! This skirt is my favorite!! You wore it for your pregnancy pics right??? What a find, I would love to thrift one in my size!! Love the outfit! I'm so jealous of your snow! This is great! Now I wish I wasn't heading to work in a few minutes so I could stay home & write a post! Lol. can you teach me how to thrift please? You look amazing, love the headband and the blouse...cute mama, you! you are adorable! the entire outfit combo is so dang cute! i love the skirt! great look honey, i really love this skirt! What a cute look, I love that top! Thanks for hosting the link-up, I love seeing what other people find while thrifting. Also, I'm loving this outfit, especially your yellow skirt and hairbow. Hope that your New Years was wonderful! this is a neat idea to share other thrift store finds! I tried to link mine, I'm not sure it works. Love those shoes you're wearing. They're cute! What an adorable look! I really really LOVE it! Especially the headband, I must have it! Awesome idea! I totally want to link up next week! That skirt is such an awesome thrift find! You look darling, I love the bow! Yay!! I have been wanting to go thrifting, and now this will give me more incentive! So excited for this! Love that bow headband! So cute. You look adorable and cold! :) I love the midi skirts, but I can't seem to find one that flatters me. 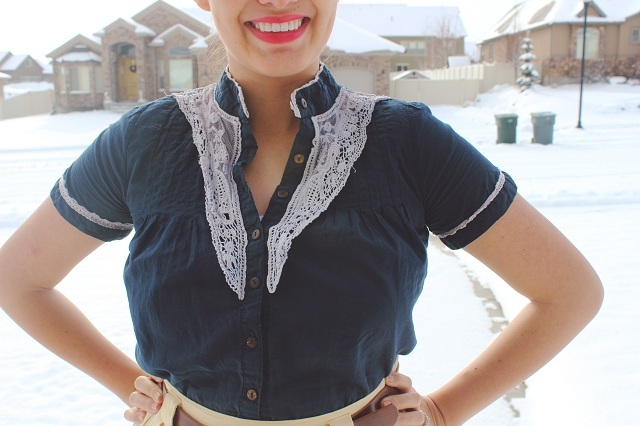 SUPER fun idea to start this thrifted Thurs collaboration...hope I can join in sometime! Love your yellow skirt to pieces, it's so on trend right now and is really soft and pretty for winter. 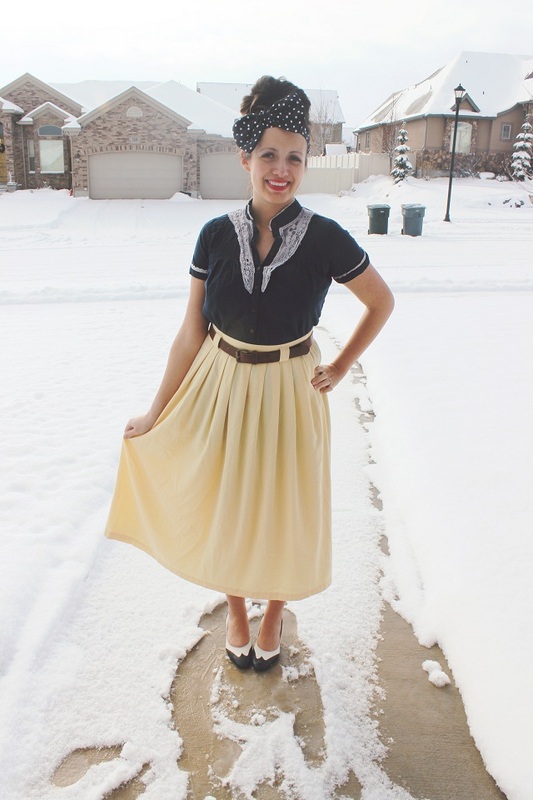 I love that skirt- and it looks so fun with a backdrop of snow!